Pex has had two updates, one since I first used it, and one after I finished using it. Here’s the release notes for the latest build that dropped on 5/1/2009. Fresh install, and rewinding back through the project I had referenced in my first post. This time I need to build a different project that doesn’t reference my day job and also how well things work with xUnit. The install was perfect again, no issues with that so far. Here are the release notes, and a few steps setting up a new project. I’m just going to start a new project and start from scratch and buzz through the same examples I worked through previously. Here’s the new project setup. Now that I’ve got a new project to work against, we can generate the Pex test project and ask Pex to get busy. First we’ll ask Pex to create a new xUnit test project. 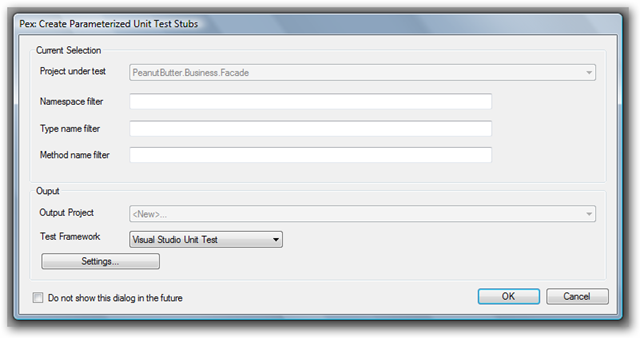 Right-clicking the Facade project exposes the context menu, we’ll choose “Create Parameterized Unit Test Stubs”, aka PUTs. 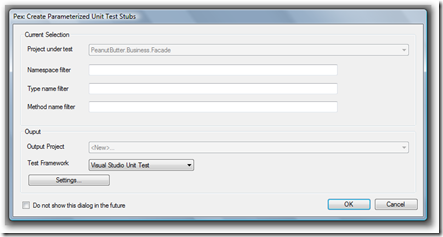 This gives us the following dialogs to set our project properties. 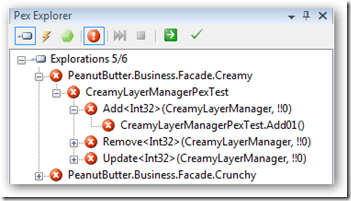 I’ll leave the blanks blank, those exist to filter the namespace, type name, and method names you want to filter for the project under test. We want all of them, so they’ll be left blank. 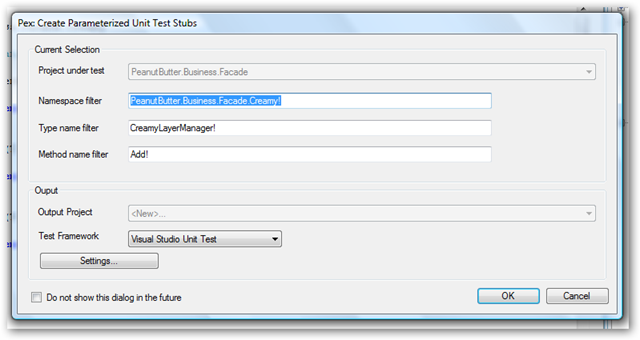 A variation on this is if you open the context menu inside the class file. The filter fields are filled in for you to limit Pex’ interaction. Here are the settings I’ve chosen, I’m going with xUnit this time around. 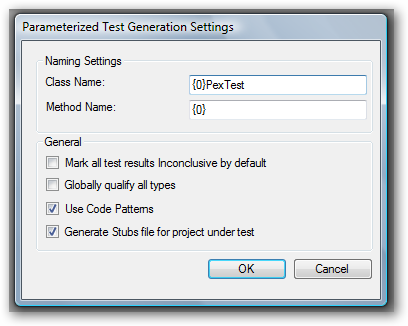 The “Settings…” dialog is where I tell Pex that for all unit tests created, each will have the PexTest suffix. 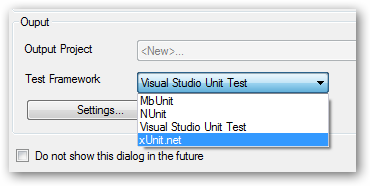 "Mark all test results Inconclusive by default" - This setting will add the Assert.Inconclusive() assertion at the bottom of the test method which is the default for all Visual Studio unit tests when they are generated in the IDE. 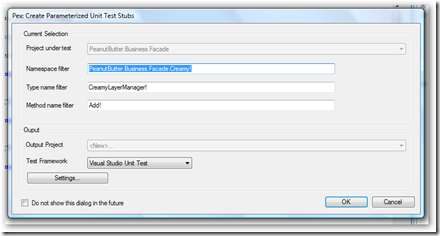 "Globally qualify all types" - This setting will prefix all fields in the test class with global qualifier. 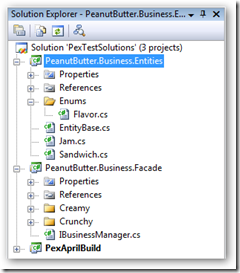 "Use Code Patterns" - Pex utilizes many different code patterns which are beyond the scope of this document. You can find them in this document's appendix. 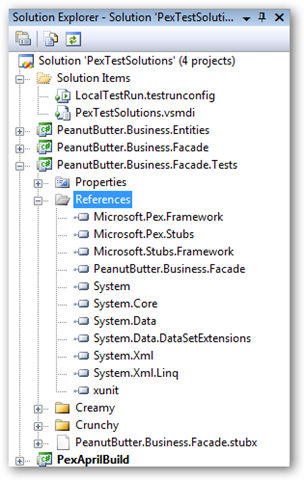 "Generate Stubs file for project under test" - The Stubs Framework utilized by Pex is explained by one of the authors here. We click OK on the settings dialog. We click OK on the main dialog, and Pex shows us the dialog pictured below. We’re getting a unit test project called …\ProjectName.Tests (plural suffix); now is your only chance to move this project around. If you like to keep your unit test libraries somewhere else besides the project it’s testing move it to that place. The MSTest dialog gives us a singular suffix. So if you have both, this might help you keep them apart. Hopefully they will allow us to (re)label them in future versions of Pex. 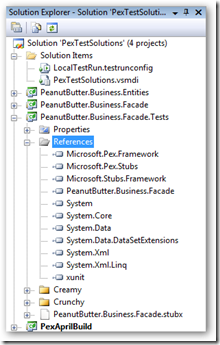 If Pex can’t find your test runner, you’ll be prompted for the location. Here are the new pieces Pex has added. A few things to notice here. We get one Pex class for each of our classes so the test methods are segregated neatly. The point to make here is to get everything neat before you generate the test project. Also, notice the suffix, "PexTest". 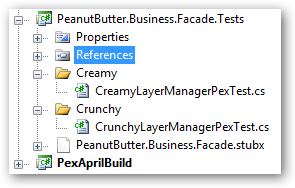 We can't rename the class library suffix, so I chose to rename the class files so I know by looking at the project members which classes are mine, and which ones were generated by Pex. Also, the stub file mentioned previously is generated for us. Here’s what Reflector can show us about what was created as well, the crunchy layer looks pretty much identical to the Crunchy layer. 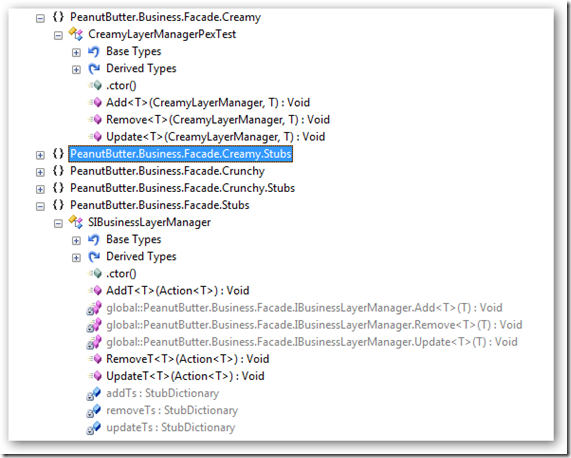 The only Source Analysis violation are related to moving the using statements inside the namespace declaration and the adding the method arguments to the summary block. 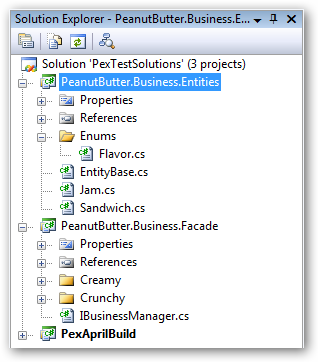 Source and Code Analysis compliance was one of the latest features added to the Pex release in use. 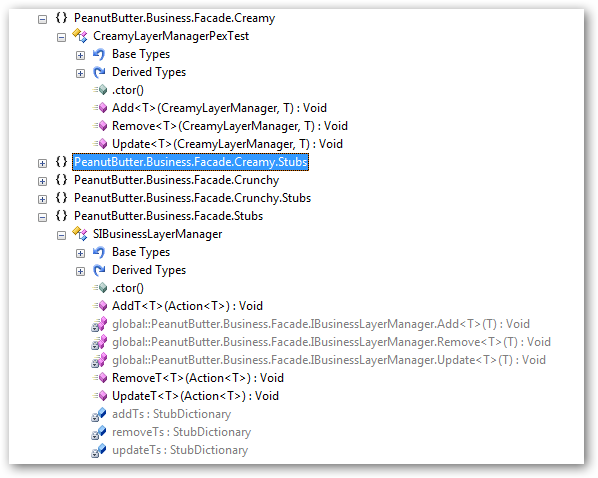 Notice the method decoration "[PexMethod]" This method won't be visible to the xUnit test outline since unit tests are reference by the FactAttribute. If it would have been decorated with "[Fact]" it would. 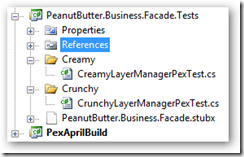 Also notice Pex methods are parameterized (PUTs) tests. The xUnit methods will be generated from, and by, the PUTs. 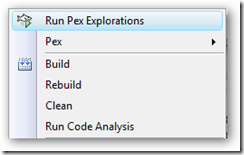 The PexMethod(s) will be used during the Pex Exploration we will step through now. 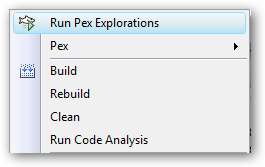 Right-clicking the test project exposes the Pex Exploration menu item which starts the exploration process. Pex Exploration finishes and the Pex Explorer tells us we have some problems - all of my methods are throwing NotImplementedExceptions” - nice. I’ll stop here, fix my code and pick-up with an Exploration exercise to allow Pex to do something meaningful with my test project. Thanks for the tutorial, it made things much easier for me to understand. Thanks for presenting an useful tutorial. It seems very useful for us. Great post. I am the frequent visitor of this website.I had already added this blog to my favorites.Thank you for sharing this! Thanks for sharing such a great post as it's very interesting and informative. 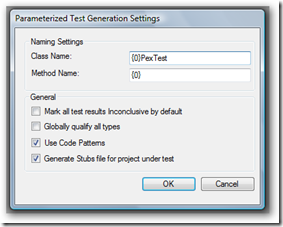 Pex generates test suites with high code coverage. It finds interesting input-output values of your methods, which you can save as a small test suite with high code coverage. Thanks for walking through this, I don't think i would have figured it out otherwise! Thanks for every other wonderful article. The place else may anybody get that kind of information in such a perfect means of writing? I’ve a presentation next week, and I’m at the search for such information. Very nice article in this post. very nice and clearly write on this blog. Super like this information, very useful. Thanks! this valuable information is worth everyone's attention. When can I find out more? I am really impressed by this blog!Very clear explanation of issues is given and it is open to everyone. It contains true and fair information. Your article affects a lot of "burning" issues in our society. It is impossible to be indifferent to these challenges. but you have captured another side of the topic. This post gives the light in which we are able to observe the reality. You can effectively eliminate cellulite by not buying creams and wacky massages. Listen to what the expert says about it. pleased to be visiting your website that always gives the information to be interesting. Good luck to her web. The MSTest dialog gives us a singular suffix. So if you have both, this might help you keep them apart. Hopefully they will allow us to (re)label them in future versions of Pex. Just love it all totally a marvelous piece of work thanks for posting an outstanding one just love it allot. Fahruni Hijab Store This blog post really grabbed my attention. jual bros With that said I am going to subscribe. Therefore I will get more updates on what you have to say. Please keep writing as I want to learn more. Ternyata Rohto Plester Fever Patch berisiko lain. Great Share.. Thank you for sharing.. It very helpful.. I hope my comments can motivate you to make another useful blog.. I was actually going through the nice helpful tips from the blog and I put respect to the writer of this post. Nice tutorial, however, I find adding icons and cursors to the tutorial, makes it easier for the viewer to know exactly what your talking about. Like protecting a computer, you want to be secure in the knowledge that we all get it. menuju hari kemenangan yang sesungguhnya. waww you write a greate article.. thank you very much dude.. I feel this is one of the such a lot important info for me. And i'm satisfied studying your article. But want to statement on some basic issues, The website taste is wonderful, the articles is actually nice . Tertarik dengan model baju muslim terbaru masa kini kunjungi saja situs FashionMuslim99 dimana anda dapat melihat beragam koleksi kami yang sangat menarik seperti Model Baju Muslim Remaja Casual Berbahan Kaos untuk referensi anda sebelum membelinya. one of a few amazing blog we have in among us nowadays. such a great post you had there, keep on posting bro, we will always support you. information 2004 nissan maxima review 2004 nissan maxima review website about 2006 bentley continental flying spur 2006 bentley continental flying spur. car Mitsubishi Lancer Evolution 2006 Mitsubishi Lancer Evolution. nissan maxima 3.5 se year 2005 2005 nissan maxima 3.5 se. mitsubishi lancer evolution year 2005 2005 mitsubishi lancer evolution. about nissan altima 2.5 s 2006 nissan altima 2.5 s.
ford focus hatchback 2007 2007 ford focus hatchback. porsche 911 turbo 2007 2007 porsche 911 turbo. The new first heard the term presented here, may now only still just read it, another time will be our practice. thanks. Current-Logic.com now provides a selection of adjustable DC-DC Converters, which is very convenient to integrate into user's prototype / design projects. These output adjustable dc-dc converters are usually open-framded unit for prototyping or experement work. A home inspection is typically one of the last steps that you have to take before buying a home. There are a lot of factors to consider and the entire home buying ordeal can be overwhelming… But it doesn’t have to be. Our Inspector will help you with this process and we conduct inspections in the San Fernando Valley area. We ensure that our clients experience an easy transition. Whether you’re getting ready for a night out with a friend or meeting co-workers for a business lunch, the right jacket can make a difference in your comfort and confidence. Amazon.com carries sports coats that can turn many different casual outfits into more polished, dinner-ready ensembles. and free alterations across their stores of associated brands for a fully secure and exciting shopping experience. It really doesn’t get better than this! Thank You this post really Help Us For Reader.